Alabama legislators passed a new law that changes the sales tax bond rules for retailers in the state. The amendments were made in House Bill 151 that was signed by the Governor on March 27, 2018. The new law stipulates that retailers who apply for an initial sales tax license or renew an expired or cancelled license for gross receipts will have to obtain a sales tax bond. The effective date of the new rule is January 1, 2020. Here are the most important points in the bill that affect your Alabama retailing business, and how to comply with them. Alabama retailers will have to post a sales tax bond prior to obtaining a sales tax license in the state as of 2020. The required bond amount set in the new law is $25,000. You will need the bond in most cases, including when you apply for a sales tax license for the first time, as well as when you want to renew an expired or cancelled license. You will have to keep the bond active for the first two years after your initial licensing. Afterwards, you will not need to continue it if you have collected and remitted all sales tax for the bonding period. In case, however, that you have failed to do so, you’ll need another bond. Its amount should be your sales tax liability for the three months just before the time when you failed your compliance, but no less than $25,000. Additionally, if you are a member of a controlled group or a part of a related company that has been bonded for two years already, you will not be required to get a new bond. What’s the goal of the new licensing requirement? The sales tax bond protects the state against illegal actions by the bonded party, which is your retailing business. If you fail to collect and remit all sales taxes on gross receipts, you can get a claim against your surety bond. In this way, the state bodies can be financially secured. If the claim is proven, you will have to make all due payments, thus ensuring you cause no financial losses to the state. It’s important to get familiar with the way bonds work prior to obtaining your sales tax bond. In this case, the Nevada Department of Taxation is the party that requires you to get bonded, so it is the obligee. Your business is the principal. The surety is the third party that provides you with the bond you need. Your Alabama sales tax bond functions as an extra layer of protection for the state. It ensures that you will follow all applicable rules, and most importantly, that you will collect and remit all necessary sales taxes. In case you fail to do so, the bond amount is the maximum compensation that can be sought for your non-payment. To get bonded, you only need to cover a small percentage of the required bond amount. Instead of $25,000, usually you have to pay about 1% to 5% of that amount. This is your surety bond cost. It is formulated on the basis of your personal and business finances. The more stable they are, the smaller the bond premium is likely to be. 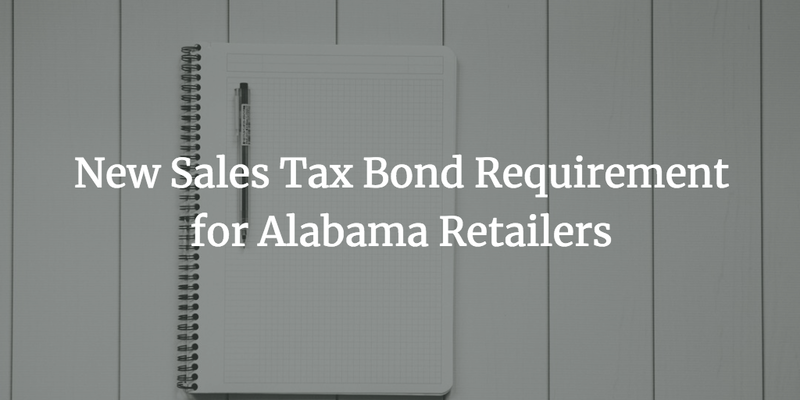 Do you have further questions about the new bonding requirements for Alabama retailers? Don’t hesitate to contact us at 877.514.5146.